First of all, light the torches with the Fire Rod (the top-left pot has a full refill) and go through the door. Use the Boomerang to retrieve the Small Key and open the chest for the Map. Now go back out and head left. Hookshot yourself over to the chest and open it for the Compass. Go through the door. Go back and down the stairs to B3. Go down the right-hand stairs. Head right and up through the door. Make the sphere blue and open the chest for the Power Glove. Now go down, right, and down the stairs. Here, kill the enemies to open the door. The top-left pot contains a full refill if you want it. Anyway, go through the door. Head up and open the chest for a Small Key. Go right. 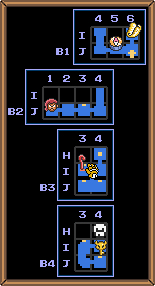 Avoid the fire and open the chest for the Big Key, then go back left, unlock the door, and go up the stairs. Open the Big Chest for the Cane of Somaria. Use it on the "?" to the right to create a platform across. Go through the boss door. Stock up on what you want and fall down the hole. Use the Fire Rod twice to melt the ice. Avoid the falling ice while attacking the boss with either the Fire Rod or your sword. From B2 J-3 bomb the left-hand wall for an upgrade thief (400 Rupees for +10 maximum bombs). Collect the Heart Container and Tablet and you can leave the dungeon. This page was last edited on 18 January 2012, at 23:14. This page has been accessed 2,944 times.